The following is a true story – though difficult to believe. One day as I was looking through some old photos at a local antique store, I found a familiar face staring back at me! 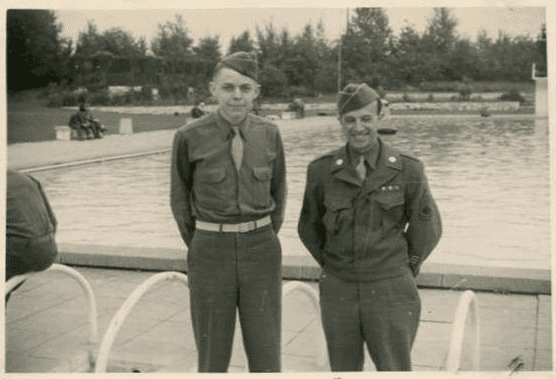 Photo: WWII soldiers, though not relations of the author. Credit: State Archives of North Carolina. Now before I continue, you need to know a few things about me. Although my family has lived in Southern California for five generations, they lived more than an hour or more from where I live now. And, nothing out of the ordinary ever happens to me. I have never rapidly spun a microfilm wheel in frustration to have it miraculously land on my ancestor’s document, or talked to a person sitting next to me at a library only to discover that we were long-lost cousins. I know these types of incidents happen to others, but never to me – until the day I found that old photo. That familiar face on the photograph at the antique store was my young paternal grandfather in his World War II uniform. I knew this photograph, because I have the same image at home. As I continued searching through the photos at that antique store, I found about eight other 1940s-era photos of my cousins, and other family members. Where these photos of my family came from remains a mystery. I may never learn the truth. While my experience is extraordinary, I do know that you can have some of the same luck using online genealogy websites that specialize in ancestral photos. Let me tell you about three such websites that you should take a look at. Probably the first thing people notice about Dead Fred is the unusual name – but this website is an important photo archive, and in some cases the repository of orphan photos that might help you find an ancestor. Dead Fred is a collaborative effort of family historians who own photos or find orphan photos that they want to share. Search by surname, keyword, or a more detailed (advanced) search. Don’t forget that some of the photos submitted are mysteries and so they will most likely be missing a surname, but don’t let that dissuade you from conducting a “mystery” search. You can also browse surnames alphabetically. When you find photos you are interested in, click on them to learn more information about the photo, including details that may help identify it. An option to contact the submitter of the photograph might result in finding even more photos of your family. Like Dead Fred, volunteers upload photos from their collection or orphan photos they purchase, and share them with the community. I can tell you that in one of the client projects I worked on I found uploaded to the website an entire album’s worth of photos, purchased by an AncientFaces member at an antique store, that we reunited with the family due to the generosity of that member. AncientFaces is a great website to bookmark and check back with regularly. You know that FamilySearch is a must for finding family history records – but did you know it’s also a great place to look for photos shared by unknown-to-you cousins? You can find all kinds of images by going to the Memories section of FamilySearch. Please note that you will need a free account to access this part of the website. Once you are signed in you can do a search on your ancestor’s name or surname by clicking on “Find” in the toolbar and see what images have been uploaded, everything from documents to portraits. In addition to Googling your ancestor’s name, search genealogy websites that house ancestral photos. It may seem like a shot in the dark, but it is one more important tool for finding your ancestor’s story. Take some time today to search for that long-forgotten or unknown image of your ancestor. You just might be surprised! Very helpful article, Gena. Thank you! Thank you for taking the time to read and comment on my article Vernon. I appreciate it! Thank you for this article. I never heard of “Dead Fred.” I had heard of “Ancient Faces” but didn’t know what it was like. “Family Search” is also a great place to find gems like death certificates and obituaries. FamilySearch is a great website. The beauty of it is that people also upload their ancestral photos to the Memories section. There is so much out there to explore! Looking forward to trying these and adding some photos!! Thank you! This article was very informative. Thank you. Vonn, Thank you for your comment. I’m trying Dead Fred today! It’s a wonderful site to explore! Sounds great. I hope I will be able to find those unknown photos. Thank you for your help. Wow!! Great resources! Thank you. Thank you , Christine. I appreciate you taking the time to read and comment on my article. I have about a dozen photos of my grandfather’s unit in France (WWI). Some have names; none have dates. I wondered where I could post them for families to view. I will post them on Family Search. Thanks for your article. Don, thank you for sharing those. You can also upload them to Dead Fred or Ancient Faces. What a wonderful surprise for those soldiers’ descendants to find! Thank you for sharing your knowledge with me and countless others. You’ve given us great clues in the constant hunt for more insight into the lives of our ancesters. Hazel, thank you so much for your kind words. I really appreciate that. Gena, great article. Thanks very much! Had never heard of DEADFRED nor ANCIENT FACES before. Thanks for the helpful article. Will check out the sites you mentioned. Susan, I’m happy to spread the word about those two websites and the service they provide. Good luck! Thank you. I’ve been on FamilySearch for 6+ years and it hadn’t occurred to me to check memories on my ancestors. When I originally started there was nothing there. Thank you, I needed that reminder. Monica, It’s always a good idea to revisit familiar websites to see what’s new. I think we all could use that reminder. I know I do! Good luck with your search!